There are so many different laptops out in the market today, that it becomes extremely difficult to pick one laptop if you have a budget of Rs 50000 and want to buy the best gaming laptop in this price range. To make your purchase decision easier, we have picked just two out of the many laptops that we have tested – one comes with HD (1366 x 786 pixel display) which is more than enough for gaming in this price bracket and the second comes with Full HD display (1920 x 1080 pixels) which is excellent if you also do browsing, photo editing, office applications etc – apart from gaming of course. Processor: We do not recommend going for anything less than the 5th Generation i5 (2015) processor. i3 isn’t good enough for gaming and i7 is expensive. Core i5 provides the right balance between performance and value. Graphics: For a price under 50k, we recommend settling for no less than the Nvidia GeForce 940M. RAM: 8GB is sufficient. If your laptop comes with 4GB RAM, you need to spend a little more to increase the RAM. Display resolution: If gaming is what is important for you, then HD (1366 x 768 pixels) is good enough. Most laptops low / medium budget laptops come with HD displays. We have been testing the HP 15-ab219TX for quite sometime now. The laptop does most things right. It doesn’t generate too much heat, it comes with a backlit keyboard (which enables you to use the laptop in darkness), it has ample storage space, the sound from the sound speakers is pretty good and while the build quality isn’t the greatest, it isn’t a deal breaker either. Moving on to the more important things; the i5 processor is powerful, the Nvidia 940M with 2GB DDR3 memory allows you to play most games in medium settings. Since the laptop comes with 8GB RAM, there are no hassles of upgrading the laptop by buying more RAM. 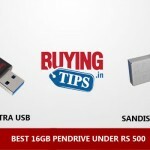 Below, we have provided links to the exact product that we recommend from reliable online shopping sites like Flipkart, Amazon and Snapdeal. You can visit the sites, compare the prices and make the purchase. Display: 15.6 inch IPS display, colour reproduction and viewing angles are good. 1366 x 768 display resolution is good enough for gaming. Operating System: Comes with a licensed version of Windows 10. Storage: 1TB Hard Disk Drive is enough space for games, music and videos. RAM: Comes with 8GB RAM which is sufficient for gaming as well as daily usage. Sound Quality: The speaker output is good for a laptop. The sound produced is loud enough and clear. Keyboard: The buttons are well placed making it comfortable to type. The laptop also comes with back lights for the keys, which allows you to use the laptop in complete darkness. At night in the train or bus for example. Connectivity: Comes with 3 USB slots. One is USB 2.0 and two are USB 3.0. Supports HDMI and Bluetooth too. 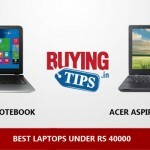 Price: It’s a well-priced laptop, providing good value for money. Build Quality isn’t the greatest, but it’s good enough when you consider the fact that the laptop does most things right. We haven’t seen too many laptops get the trackpad right (except Apple Macbook), so we highly recommend that you purchase a mouse. Display is glossy, so except reflections when there are too many lights around or under bright sunlight. Battery life is average, about 3.5 to 4 hours. Heavy gaming always drains the battery fast, so again this isn’t a deal-breaker. The alternative is the older model HP 15-ab031TX. It has exactly the same specs as the HP 15-ab219TX. The only difference being this one has a Full HD display at 1920 x 1080 pixel resolution. It isn’t a IPS display though and the viewing angles weren’t great on this. This one is also slightly heavier (about 200 grams) and comes only with 4GB RAM – so you have to spend more on upgrading the RAM. Everything else remains the same, go for this ONLY if you think you need Full HD display. 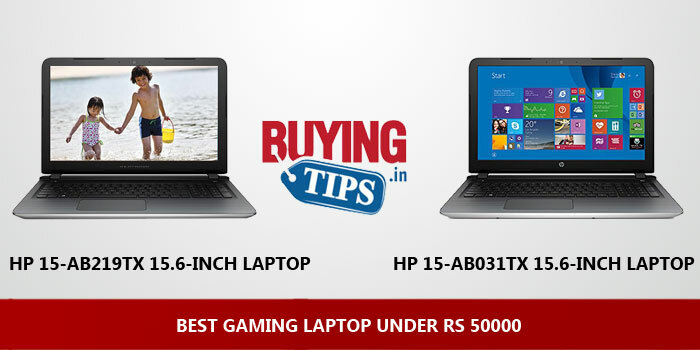 Otherwise, buy the HP 15-ab219TX – it’s a newer model, has more RAM and IPS display. The only advantage of this laptop over the other one in this article, is the Full HD display. For gaming, it’s not a big deal, because you need to reduce your display resolution for a lag free experience. But useful for document viewing, photo editing etc. Most casual users don’t need this. 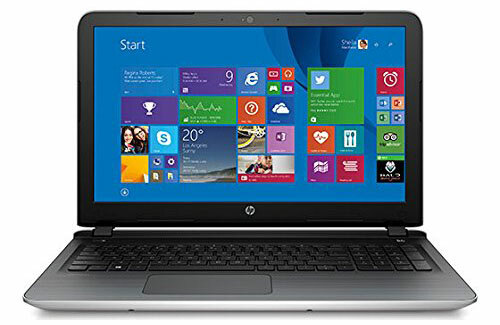 The laptop comes with a licensed version of Windows 8.1, which is upgradeable to Windows 10 for free. Sound Quality: The sound quality is above average, the volume intensity is a little lower than the newer model. However, it’s decent enough to watch movies and play music. Keyboard: Doesn’t come with backlit, so it’s a little difficult to use in the night / dark conditions. Trackpad: Again, not the best. You need to purchase a mouse. RAM: It comes with just 4GB RAM, which isn’t enough for Windows 8 or Windows 10 gaming laptops. You will have to purchase additional 4GB RAM if you want to get good performance out of it. Slightly heavier than above model. If you want to upgrade the laptop, you could invest on a SSD (solid state drive) for better performance. Contact us or drop a comment below if you plan on upgrading, we’ll help you buy the best SSD. 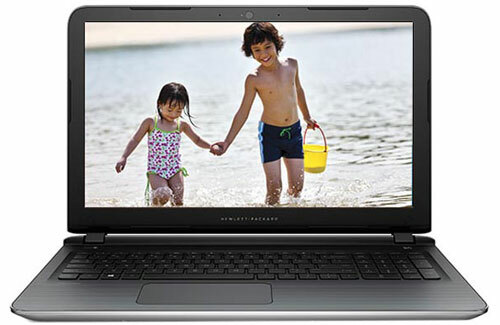 Always purchase laptops with Manufacturer warranty in India. Some imported laptops that are sold on sites like eBay, come with International warranty but we have faced issues like local service centres not willing to repair it. Some say they don’t have parts. Flipkart, Amazon and Snapdeal only sell products that carry India warranty. If you have any other questions, feel free to drop a comment below. We’ll be happy to help. Hey there when I opened amazon and got into HP 15-AB219TX it suggested HP Pavilion 15-AB516TX as a newer model can you throw some light on whats the difference between these two thanks in advance. I discovered that Windows 10 was mentioned … so I might as well ask exactly what I’ve been questioning … if I am utilizing Windows 8.1, do I HAVE TO update to Windows 10?